Many times we go shopping and forget to focus on basics in order to have a workable wardrobe. How many times do you look in your closet and tell yourself you have nothing to wear? I only started focusing on basics a few years ago. When you stock up on basics, you will always have something to wear and stretch your wardrobe for unlimited mixing and matching options. I can actually create several outfits with these basics. Next time I'm going on a non business related trip, I might refer back to this and pack similar items to create different outfits. 1. Slip on Sneakers: These slip on sneakers are popular this season. They are great to wear with shorts and cuffed jeans and more importantly, they are comfortable. I see myself wearing this every weekend in place of my flats. 2. Open Front Cardigan - This is great for chilly days and nights, layered over a tee or tank to add dimension to your outfit or balance your shape. 3. Maxi Skirt - Maxi skirts are comfortable and a change up from wearing pants. Wear with a knotted tee shirt layered with a jean jacket, or chambray top 4. White tee - The white tee is very versatile and can be worn alone or layered under a jean jacket, cardigan, or vest. It will also work great with colored pants and will pair well with a printed scarf or statement necklace. 5. Bermuda Shorts - Shorts are great for the hotter days of summer and for play. I actually bought the pair shown in February because last summer, I looked high and low for bermuda shorts and couldn't find any. 6. Comfortable Jeans - Everyone needs a pair or two of comfortable jeans. This pair looks comfortable yet stylish. 7. Striped tee - Need I say more...everyone loves stripes. Wear with colored bottoms or tucked into a circle skirt. 8. Layering Tank - Wear alone or layered with anything J Crew Factory, Gap and Old Navy are three stores where I shop for affordable basics. Are you lacking any basics? Do you focus on buying basics? My closet is continually lacking basics! I need some well fitting plain tees! 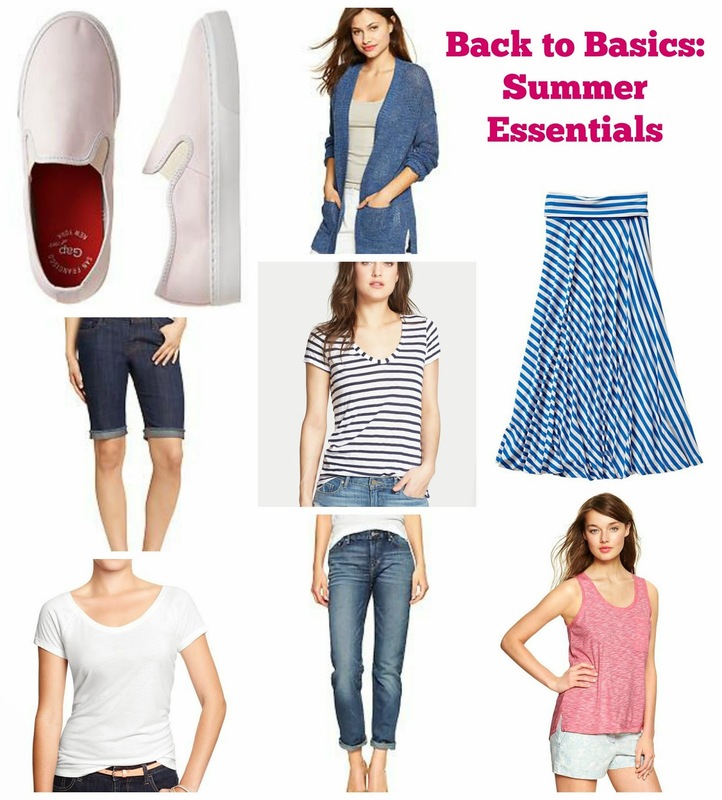 You can never have too many basics in your wardrobe! Thanks for linking up!! KOLORS offers personalized, solution oriented beauty, skin and hair therapies with necessary interventions and treatments being administered from time to time by experts. BEAUTY BASIC .